You could call this Chilled Chili if you'd like. Sort of like the hot stuff- delicious, filling, and easy-- but colder! And tomato vinaigrette? You could put it on just about anything and it would be delicious. For vinaigrette: combine all ingredients in a blender and mix until combined. For salad: combine all ingredients in a large bowl. Add vinaigrette and toss to coat. Cover and refrigerate for 3-4 hours. Serve garnished with fresh cilantro if desired. I can't waste food. I just can't do it. And, as you see by my last recipe, I had delicious homemade tzatziki dressing leftover. Sometimes I go to many many lengths to use up leftovers. This is not THAT extreme. But it IS delicious. Praise sweet corn season! Heat olive oil in a large skillet over medium-high heat. Add onion and saute until fragrant, 2-3 minutes. Add corn and continue to saute until softened, 4-5 minutes. Sprinkle mixture with salt and pepper and stir in frozen edamame. Cook until heated through, then remove from heat. Transfer mixture to a covered container in the refrigerator and allow to cool for 2-4 hours (or overnight). Mix cooled corn mixture with chopped tomatoes, cilantro, and dressing. Cover and refrigerate for 30 minutes prior to serving. Serve this lovely dish as an app or side dish to your next summer get-together. You'll be the talk of the town! Heat grill, then reduce heat to medium. Soak 5-6 wooden skewers in water. Place Brussels sprouts in a large bowl and add 1/4 cup water. Microwave for 3 minutes, until they begin to soften. Remove from microwave and allow to cool slightly (for handling). 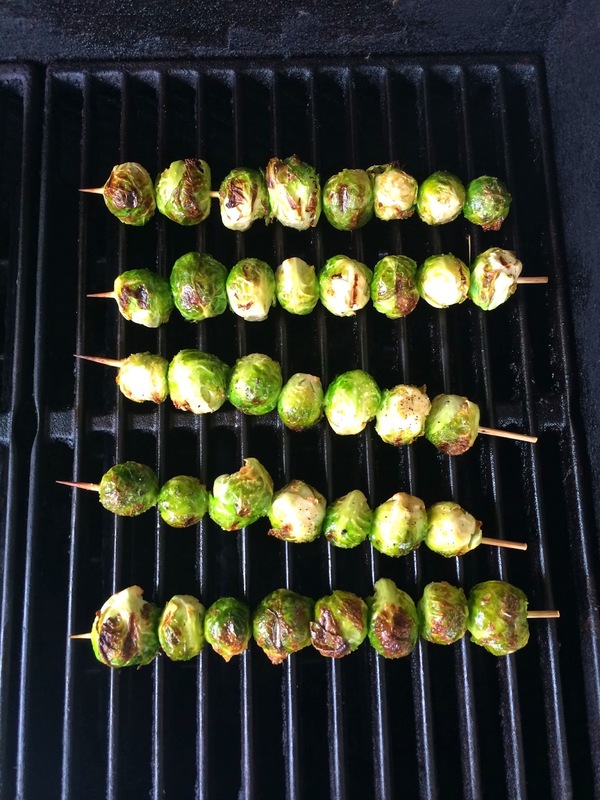 Place Brussels sprouts on skewers (through centers not stems) and spray generously with olive oil. Sprinkle with salt and pepper. Place skewers on the grill over direct heat. Cook Brussels sprouts for 7-8 minutes, turning halfway through cooking. Transfer skewers to indirect heat and cook for additional 5-7 minutes, or until soft. Remove from the grill and allow to cool for 3-4 minutes prior to serving. For tzatziki: combine all ingredients in a food processor and mix until smooth. Place in a covered glass container in the refrigerator until ready to serve. Beets are just one of those foods. You love 'um or you hate 'um. But if you're in the "hate 'um" club, I really think you should give them another chance. They are so good for you! And a pizza is the perfect chance for that second date. Preheat oven to 400 degrees. Place beet slices onto a baking sheet that has been prepared with olive oil spray. Spray beets with additional olive oil, then sprinkle lightly with salt and pepper. Bake for 12-15 minutes, flipping slices halfway through cooking. Remove from oven when soft. Lay tortillas on a separate ungreased baking sheet. Spray each tortilla with olive oil, then lay beet slices evenly on tortillas. Sprinkle each pizza with cashews, feta, and shallots, then top with 1/2 cup baby arugula leaves. Sprinkle each pizza with salt and ground black pepper. Place baking sheet into the 400 degree oven and bake pizzas for 5-6 minutes. When tortillas are slightly firm (but not crisp), transfer pizzas directly to the middle rack of the oven to finish cooking for 3-5 minutes (watch closely). Remove pizzas from the oven when crisp and lightly browned on the edges and bottom. Cut each into quarters and serve! 1. Tomorrow is Father's Day! Happy Father's Day to my dad (who also turns 70 on Monday), my father-in-law, my grandfathers (yep I am lucky to still have both), my brother-in-law, and my wee one's daddy/ the love of my life!! 2. This is a fantastic little gem of a gift website that I've stumbled upon. Lots of fantastic artisan gifts- sort of like Etsy but far less overwhelming! Check out Scoutmob. Confession: I've never been a big fan of beer. And I'm waaaayyy beyond the point of needing to pretend to like it impress some guy in college (confession #2). But this, THIS, I can enjoy. And even if you're not a beer fan- the ginger lemonade would be delightful on it's own- or with a shot of something or other. Great addition to your summer fete or camping (glamping) trip! In a small saucepan, combine lemon, ginger, and sugar. Bring to a boil, stirring constantly, then remove from heat and place in a covered glass container in the refrigerator to cool (~2 hours). Prior to serving, combine club soda with lemonade concentrate in a large pitcher. In each serving glass, add 4-5 ice cubes, then fill half with lemonade, then topped off with beer. Mix gently and serve, garnished with a lemon slice if desired. Our backyard has officially been christened as belonging to a toddler. We now have a swing set, playhouse, and sandbox. My hubby wasn't thrilled about giving up precious lawn space at first. And then he saw our wee one play on it. I was also quite psyched with the swingset. There's rings on it. AKA: my own home suspension training set-up (TRX-like). I have already had several great workouts thanks to my (her) new swingset! Here's a few exercises that you can add into your own workout! There are many many more exercises-- these are just a few of my faves! No weights needed! Add in some burpees and jump squats and you have yourself a workout! I've been working on perfecting these gems for a while now. You see, the cookies at Discovery Basin Ski Area are the bee's knees. I grew up skiing at this resort, and still do occasionally. Their fresh baked cookies are always warm, thick, gooey on the inside, and in other words, perfect. I could never figure out how they stayed so thick. And then I played around with shortbread. This is a smaller version, but pretty darn close. Even if you've never had one of Discovery's cookies you can still appreciate these! I think it's safe to say that I've found my go-to chocolate chip cookie recipe. And the best news ever? There's only 6 ingredients! Preheat oven to 350 degrees. Use a mixer to combine butter and powdered sugar until well-mixed. Add vanilla extract and salt, then sift in flour gradually and mix until combined. Use a spoon to stir in chocolate chips until evenly distributed. Place dough in the refrigerator for 30 minutes prior to rolling. Prepare one large baking sheet with parchment paper. Roll dough into 2" balls and place 2" apart on paper (they do not spread much). Press down lightly on each ball to spread it slightly. Bake on the center rack for 10 minutes. Remove baking sheet from the oven and allow to cool for 2-3 minutes before transferring cookies to a cooling rack. Store in a Ziploc bag or airtight container once completely cooled.